To install this beta just copy the "modules", "override", "streammusic" & "streamsounds" folder to your SWKotOR Directory. For now you will need to have cheats activated in the swkotor2.ini file and use "warp yav_m50aa" to get to the level. "EnableScreenShot=1" which saves a screenshot to the game directory in .tga format when you press print screen. help me along the way will be noted here. Tools used that made this possible. Users that helped make this possible. JCarter426 & Everybody that helped them along the way. ebmar for noting to use the vanilla tpc format. Kexikus for clearing up issues about the texture packs. Could you explain this mod for someone who's been out of the loop for a while? 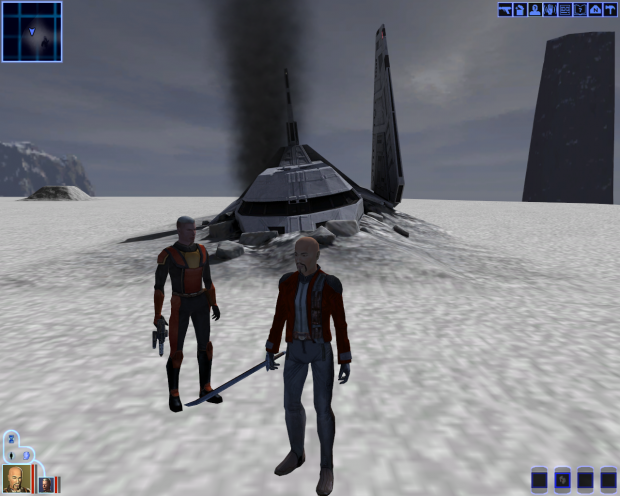 Is it an original story addon or something/an idea taken from somewhere else and modded into kotor ? Is it something to play after the full game has been played? And is there one release for each ? ie:K1 + K2. Sorry ,hope you don't mind the question ,just a bit confused with all the mods i'm coming across while getting ready for a new play-through of kotor 1 and kotor 2. I'm just collecting all the mods together beforehand. This is going to be epic! I'm hoping to get a working galaxy map travel system working if you can't someday, but it will depend entirely upon how much time I have for KOTOR modding.